With NBC's announcement this week that Community would not be on the midseason schedule, the Community community went nuts. They did things as crazy as start an online petition and even created a #SaveCommunity hashtag which upwards of six people have followed! While I fully support these OccupyNBC style protests, I don't think they'll be enough. We need to do more in order to make NBC actually take notice. Online petitions almost never actually work. People feel good about making them, even better about signing them, but as far as I know, a show has never been saved by an online petition, Target has never not opened at Midnight Black Friday because of a petition and Barack Obama was never made to be born outside of the United States because of said petition. We need to do something more noticeable that will make the head honchos at NB realize there's a strong fan base. After Arrested Development's second season, that show was placed on a similar bubble. It could be renewed, it most likely would not. Fans got together and sent FOX President of Programming Peter Liguori gift baskets filled with banana stress balls, feather boas, pirate stickers and presumably, Michael Cera. Several thousand inside jokes later and the FOX brass got the message, they renewed the beloved series for a 13 episode final season. What if we lived in an alternate reality where Community were a ratings bonanza? What if we rolled the die and didn't have to go up against The Big Bang Theory? These represent intriguing realities that the evil versions of us would never have to experience. No felt goatees for these fans! Let's take the dice concept and bring it to the next level. Let's bring it to the Community level. 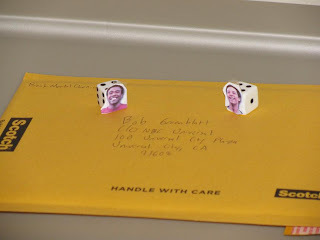 We should send “gift baskets” filled with dice made out with Community inside jokes to NBC head honcho Bob Greenblatt. 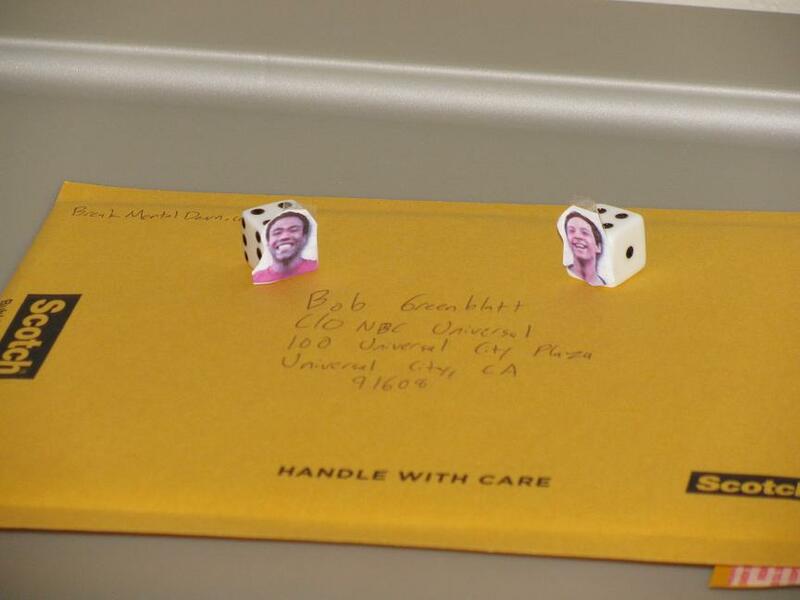 Put pictures of Troy and Abed on the dice, include pictures of you with your homemade Starburns. Anything that's funny and interesting should go in this gift bag. This will give Greenblatt a physical object he can hold, feel and roll to show how dedicated we Community fans are. Who knows, maybe he will roll that alternate reality where we're all happy with six seasons and a movie of Community. Also, even though I question how well they work, sign the Save Community petition at http://www.save-community.com/ One thing I know is, it couldn't hurt.